We’re a bit slime obsessed. We’ve tried so many slime recipes, but we still aren’t tired of making and playing with it. 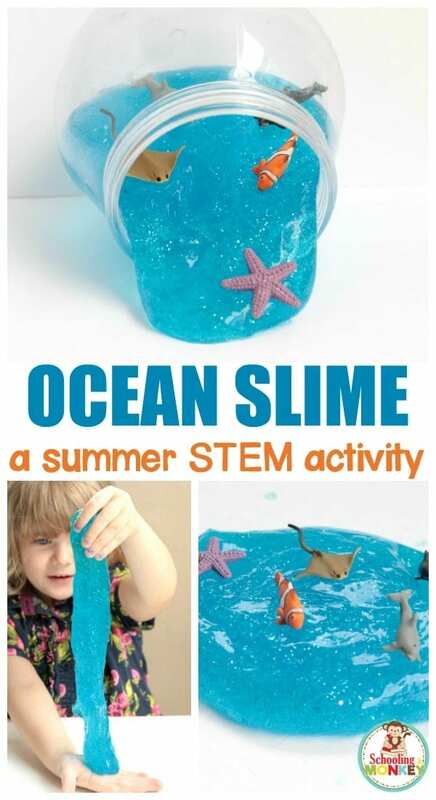 This time, we decided to make an ocean slime recipe to celebrate summer, warmer weather, and fun! 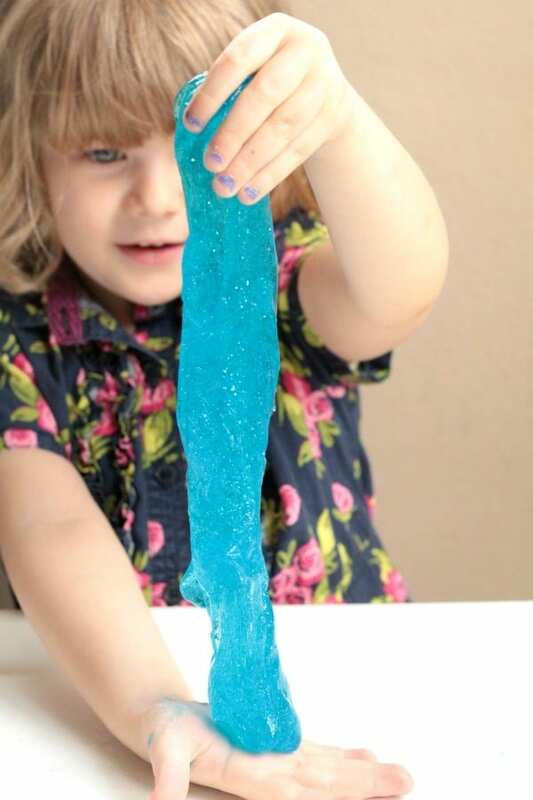 This blue ocean slime recipe uses a classic Borax recipe that is easy to make, and nearly foolproof. 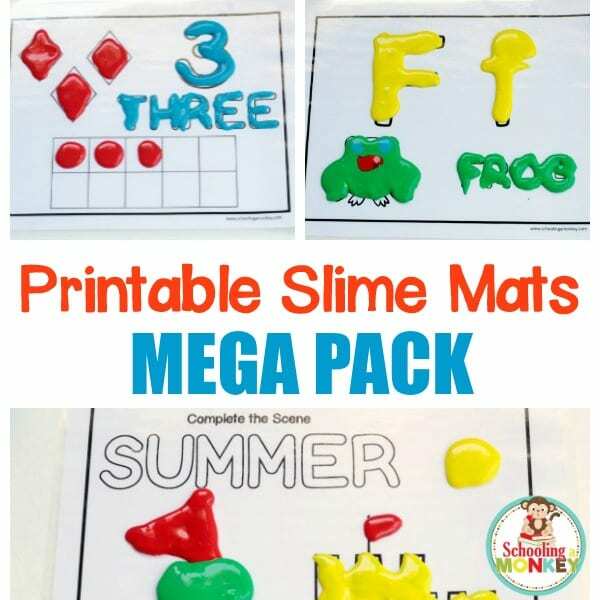 Use the recommended brands and ratios and your slime will come out perfectly every time! 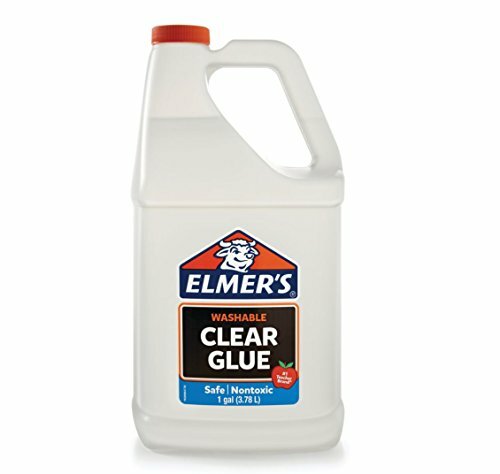 The secret to making beautiful ocean slime is to use clear glue. If you use white glue, the slime will work, but it won’t look like sparkling ocean water. Adding glitter also adds a pretty touch that transforms the slime into ocean water. 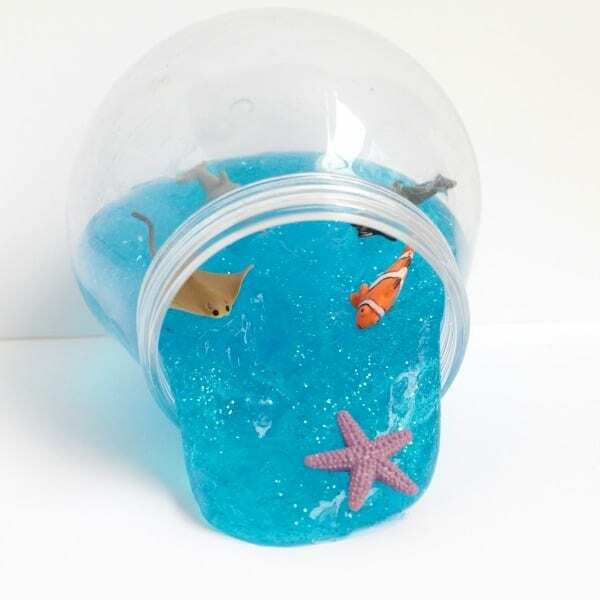 Add little ocean creatures to your blue glitter slime to capture the spirit of the ocean and make your slime play educational! 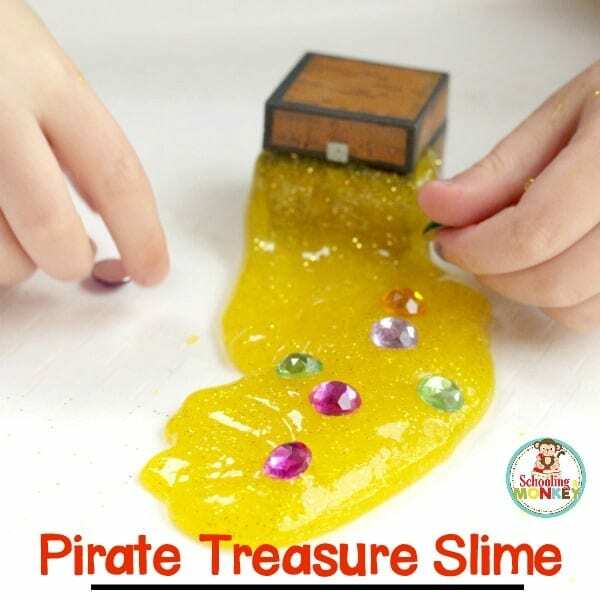 For more fun slime recipes to try, you may also like fluffy slime, rainbow slime, and galaxy slime! 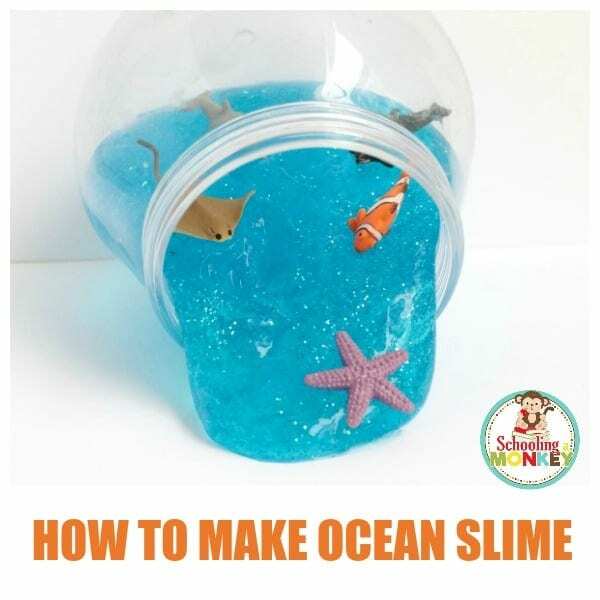 Read on to see how to make ocean slime! And don’t forget to try our other summer slime recipes: ice cream slime, sand slime, and beach slime! Slime is made when boron mixes with the polymer chains in the glue, creating strong, but flexible bonds between the molecules. There are so many fun tweaks you can make to a basic slime recipe, like my kid’s favorite, fluffy slime! Since this slime does contain borax, if you have a sensitivity to it, you may want to try our baking soda slime instead. If this is your first time making slime, you should follow along with our post on slime troubleshooting. Luckily,liquid laundry starch slime made with clear glue is the easiest slime recipe. 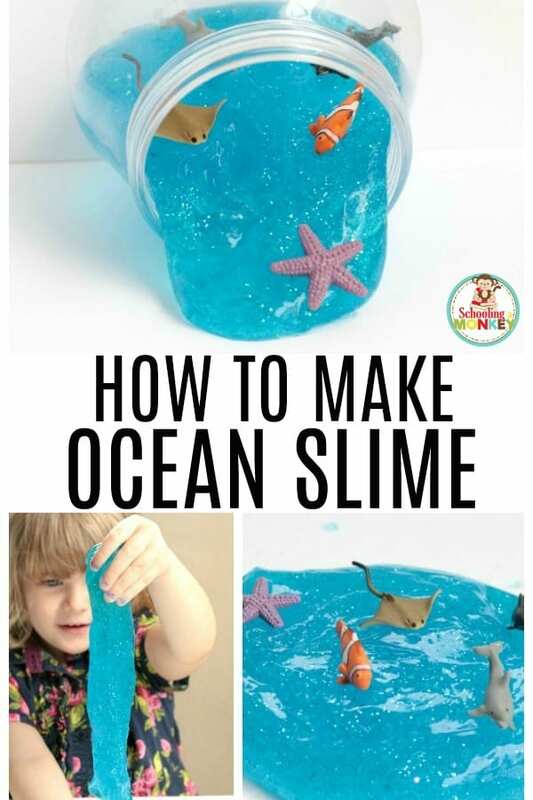 Follow these directions and you’ll have the best ocean slime ever! If you need more help making slime, check out our printable slime guide, where you’ll find tips and tricks to making your slime perfect every time so you don’t have to waste ingredients. 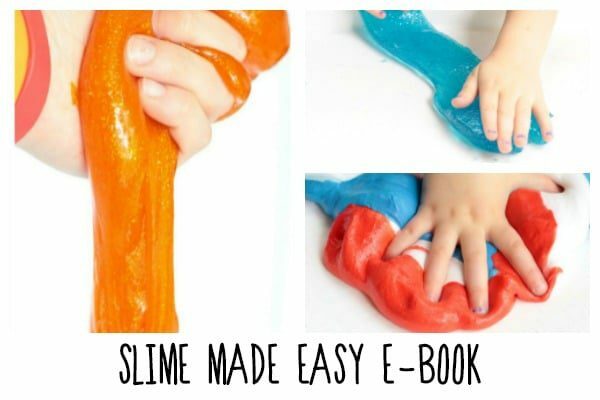 You can also purchase the Slime Made Easy E-book, which includes all our favorite recipes of slime and gives fun ideas for things to add to slime to make it different every time! Kids will love this sparkly slime that looks just like sparkling, clear ocean water! This will soon become your favorite slime of the summer. 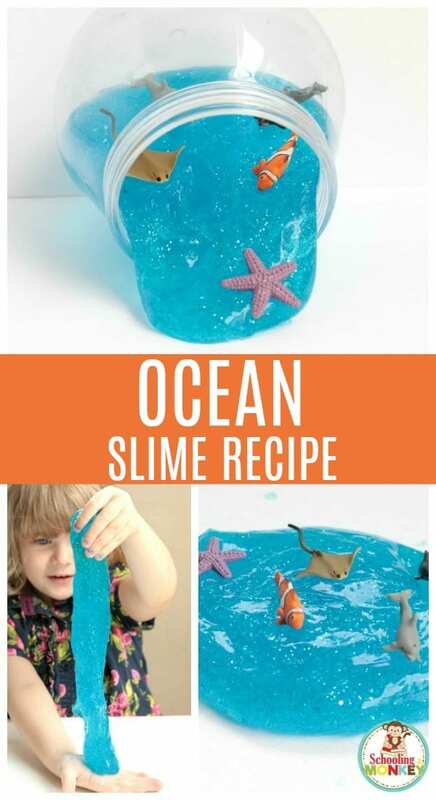 The ocean slime recipe is easy to follow and you’ll love it’s stretchy, non-sticky texture. Borax slime is less sticky than other slime recipes, because it makes a stronger, more brittle slime. Borax slime is not the stretchiest slime, but it is a lot of fun to stretch and poke. It’s also ideal for using with small toys, as it won’t cover the toys in sticky slime that is difficult to get off. Once you remove your ocean toys from the ocean slime recipe, they are just like new and you don’t have to wash them at all! 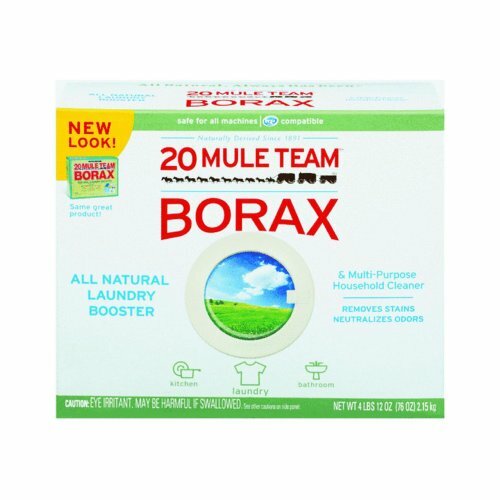 Keep borax slime out of the carpet and away from and cloth in your home, like the sofa, clothing, or sofa. Safety note: Borax can be dangerous if ingested or breathed. 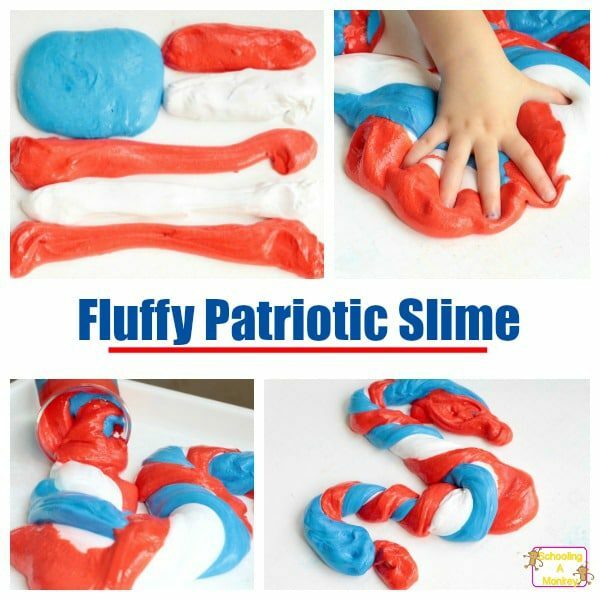 Do not make this slime recipe with kids who might place the slime in their mouths or if you know your family has a sensitivity to borax. Try our edible taffy slime if you want something safe for all ages and edible, too! You may also want to try baking soda slime and xanthan gum slime. 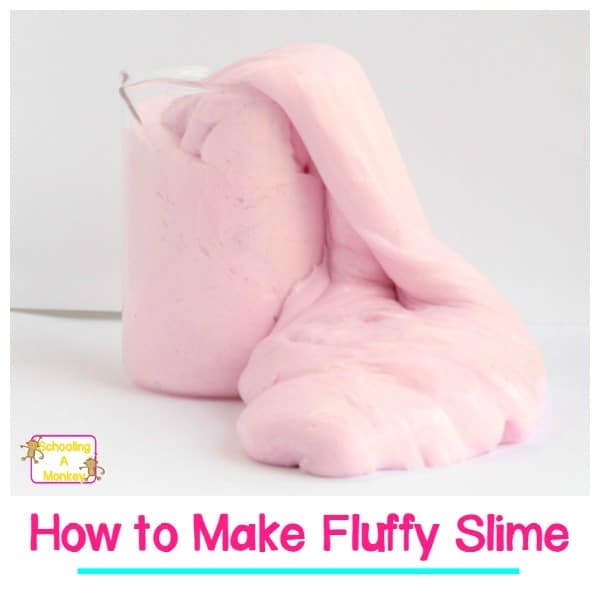 Use our classic borax slime recipe to make this slime. Mix one teaspoon of borax powder with 1/2 a cup of water. 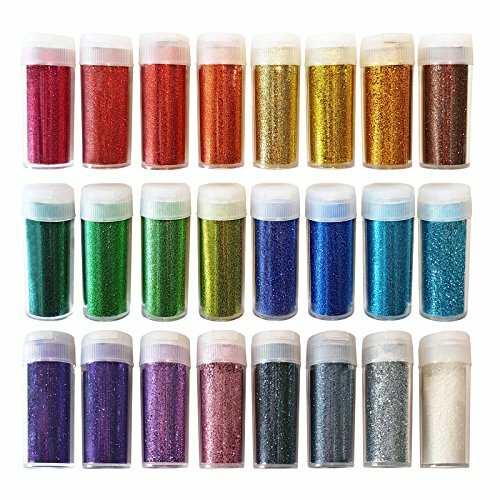 Mix 5 ounces of glue, the food coloring, the glitter, and 1/2 a cup of water to a second container. Add the borax water to the glue mixture and stir until completely mixed. Stretch and mix the slime until it stretches. Borax slime breaks a little easier than laundry starch slime, so you’ll need to be careful not to stretch it too quickly. 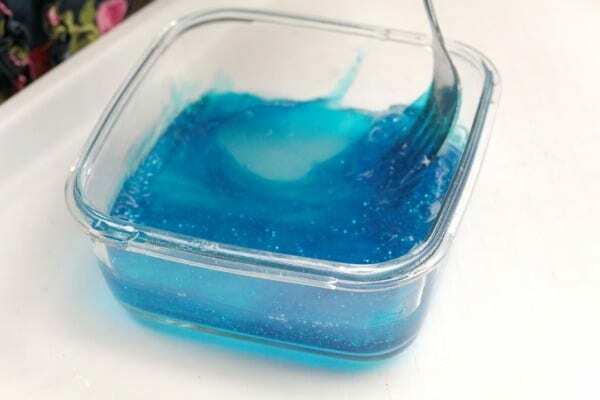 Alternatively, you can make this using laundry starch, just follow the recipe for liquid laundry starch slime and add the blue dye and glitter to that mixture. It usually takes a few minutes to prime the slime before it has the ideal slime texture. After working with it, it will start to look like this. 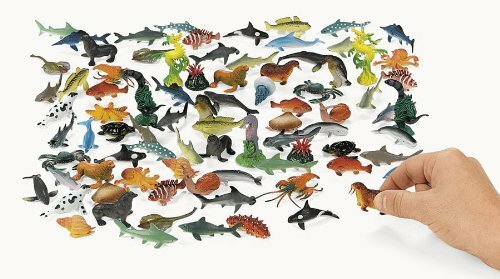 Add in your ocean animals and let your kids go crazy. My kids love using slime as the background for imaginative play. 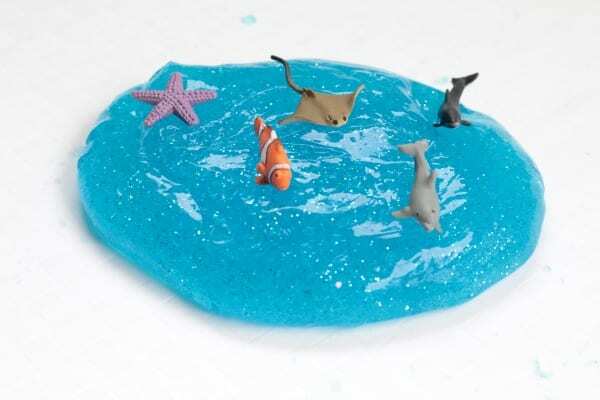 This slime looks just like the ocean, so they played for quite a long time with their ocean creatures. Bo liked trying to bury the animals in the slime, then “rediscover” them later in the slime mixture. Monkey’s preferred method of play was to set up ocean “scenes” and then admire her work. There is no wrong way to play with slime!